Lakeside Condo; A Home Away From Home! 7-night stays only during peak season (May 15 - Sept 15). Non-peak season, 2 night minimum. Grab your clothes, toiletries, and fishing equipment, and come stay at Miramar Condominiums, located at the 3 mile marker on the Niangua Arm of the lake. You are guaranteed to come back!! You will enjoy your stay in this fully furnished waterfront / poolside condo at the Lake of the Ozarks. Whatever it is you're looking for, you will find it here. You can relax by the pool, rent a boat or jetski and get out on the water, go fishing, play golf, visit a state park, or go shopping at the nearby Osage Beach Outlet Mall. There are many restaurants nearby, as well as many attractions that the kids will enjoy, including a go-cart track, miniature golf, and water theme park. You can even finish off the day by taking a trip to the ice cream stand! You can do a little or a lot, there is something for everyone. 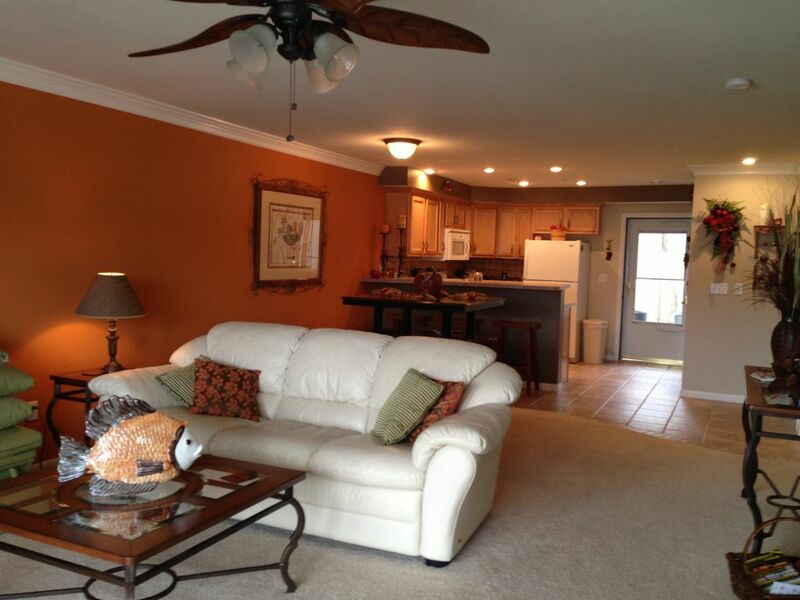 This 2 bedroom, 2 bath condo has a full kitchen equipped with everything you need. The unit is equipped with a full size washer and dryer for your convenience. The master bedroom features a queen size bed, dresser, night stand, alarm clock, ceiling fan, and walk-in closet. You can also access the patio from the master bedroom. The master bath has a double vanity and tub/shower combination. The second bedroom contains a queen bed, dresser, night stand, and a chair for some quiet reading or relaxation. The second bedroom features a sliding pocket door to the second bathroom. The second bath includes a walk-in shower unit. Unit is very clean and very well maintained! Just steps from the lake! There is an ipod hookup on the stereo! Bring your favorite music! Ground Floor Unit with handicap accessibility. The condo was very clean and the proximity to the pool and dock is hard to beat.. We've stayed here multiple times and will be back again. Glad you enjoyed and look forward to having you back next year! Have a great year! We enjoyed our week at Miramar in this condo. The location was great for us and our grandchildren who were also staying at the complex. We had direct access to the pool and a nice patio for our early morning enjoyment. Our only complaint was the condition of the blinds on the patio door since many slats were missing which compromised nighttime privacy when people were at the pool. The other item was the locked owner's closet in what was the master bedroom leaving us with no closet in that room. Response time of the owner is excellent as is the cleanliness of the condo. We had all we needed in the kitchen and great furniture to gather comfortably in the living room. With a few maintenance issues taken care of, I would not hesitate to recommend this property to other especially families who want good access to the pool. Thank You!!! Patty and John for sharing your beautiful home. We’ve rented at the Ozarks twice a year for 10 years and this condo is the best!! I am a very clean-conscious and somewhat a clean fanatic individual; this condo met EVERY expectation of CLEANLINESS, it was SPOTLESS. The kitchen was well stocked with pots, pans, dishes, storage containers, etc. We loved having a large flat screen TV in the living room and TV’s in both bedrooms. The beds we're comfy; having a washer/dryer was great and the WiFi was a definite plus. Being on the ground level was fantastic, no steps to the boat dock and having an on-site boat ramp and slip was another great amenity. And the fishing was fantastic, nice neighbors and great location. We will definitely rent this condo again and highly recommend it to anyone else. Patty is wonderful to work with and very responsive. Thank you for the raving review!! We are so glad you enjoyed your stay and certainly look forward to your stay with us next Spring!! Property was immaculate, and our stay was amazing! We will definitely come back and stay again. Glad you had a great vacation again this year! See you next year! Thank you for choosing our home ! This is the second time we have stayed in this condo. It is a lovely place and provides everything we need for a relaxing vacation. We are glad you chose our place to stay during your 2017 vacation! Extremely happy you enjoyed your stay! Look forward to you returning again! LOVELY condo, easily accessible to dock which is well-lit, great view of area with super accommodations. Easy boat launch ramp and ample trailer parking. A week well spent for relaxation and terrific fishing. Highly recommend to ALL! Have already booked our spring 2017 stay. Thank you John and Patty. Thank you for the review! We are proud of our place and are glad we can share it with others!! Talk to you soon!! 7th night free when booking weekly rentals. Rates are subject to change without notice prior to booking unit.